The applications for using 3D printing are growing leaps and bounds, even in the medical world. By now, we are all familiar with what the term "3D printing" means. At electronics stores, we see figures and models created. In an earlier blog, we discussed an application to podiatry - the 3D printed orthotic. 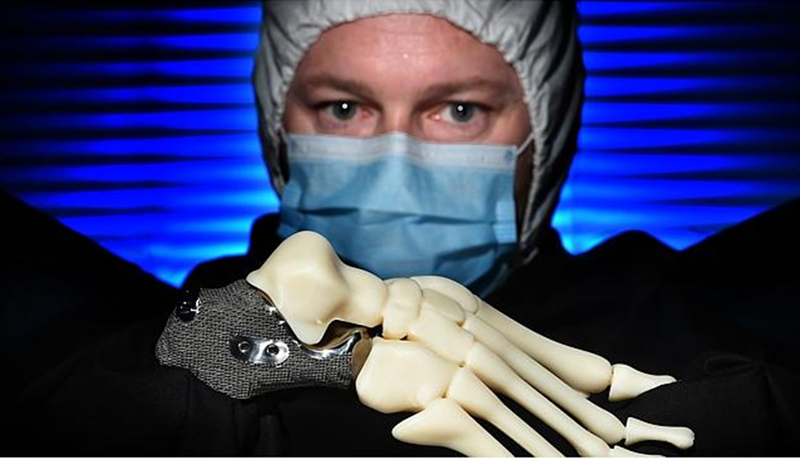 In the medical world, 3D printing has some amazing prospects. Recently a doctor in Melbourne performed a surgery to save a man's limb. The patient was diagnosed with cartilage cancer. The doctor ordered a 3D scan of the patient's left foot and made a mirrored version of the calcaneus (heel bone) to replace the affected bone. 3D printing had been used previously for replacement of non-weightbearing bones (especially those in the skull), but this was the first surgery of it's kind to replace a bone which is responsible for accepting body weight during ambulation (walking, running, etc). As the doctor in Melbourne told the patient, he had nothing to lose for trying this surgery. Should the surgery fail, the patient would be facing amputation, which was what he was originally told is typically necessary in cases like his. While cancer is a cause of amputation of the foot or part of the foot - there are other diseases that threaten to take limbs. Ulcers and infections in the foot due to Diabetes are all too common and perhaps this will be an alternative to amputation in those cases some day?